TAG helps to relocate many companies every year saving them time, money, and hassle. 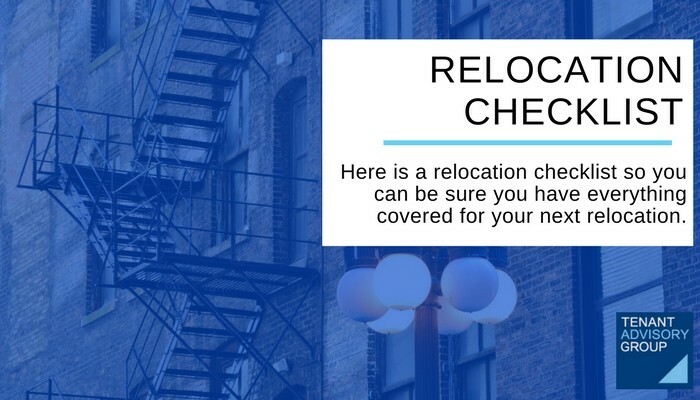 Here is a relocation checklist so you can be sure you have everything covered for your next relocation. ____ Have movers come out to premises and do a walk through to determine relocation costs. Give a basic idea of what items need to move, any equipment or funiture that has to be taken down or taken apart in one location and put back together in another location. ____ Schedule time for freight elevators and docks at old and new locations. ____ Identify and secure insurance requirements. ____ Have phone and data broker arrange for telecom to be set up at new location and canceled at current location. ____ Contact furniture vendor to make sure all needs are taken care of. ____ Any sensitive items such as bank statements, contracts, invoices, client information etc need to be separated and either filed in another area of the office or if need be shredded. ____ Prepare an inventory of everything being moved. ____ Prepare change of address- notify post office, prepare business cards and stationary, send move notification to clients and vendors, change periodicals, subscriptions, and bill pays to new address. ____ Throw out all materials not essential to be relocated. May need to arrange for additional trash removal, charitable donation pick up, or coordinating off-site storage. ____ Communicate clearly with staff and movers so everyone is on the same page with how to prepare and label the belongings and what to expect with the new location. ____ Decommission old space. Get rid of unwanted furniture and equipment. Bring space back to what the lease terms specify- broom clean condition is typical. Like anything, you should have a good team around you to help facilitate this process. Your broker should have key contacts in each of these areas that they can introduce. Always be open and honest about questions and concerns you have throughout the process.